Posts Camerons are WUSPBA Winners in 2015! This past weekend, WUSPBA held their AGM (Annual General Meeting) in Park City, Utah. The Camerons were honored to receive several awards for their performance in the 2015 competition season. Our Grade 3 band won the 1st place aggregate award for the entire competition season, beating out 6 other bands. The Grade 4 band took 2nd place, tying for first in total points. There were 33 bands that competed at the Grade 4 level this year, making it by far the most packed competition pool of them all! The Grade 5 band also won 1st place, beating out 15 other bands in their grade. 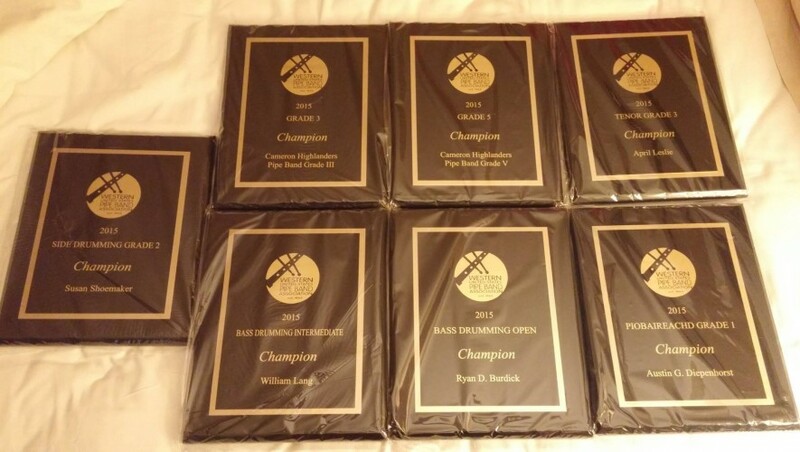 As you can see, the Cameron Highlanders enjoyed a very successful competition season this year, dominating in WUSPBA competitions all year long. You can check out the aggregate results for all bands in all grade levels here on WUSPBA’s website. In addition to the great success our bands have enjoyed as a whole, we have also had many individuals who were highly successful in solo competition. Among them were Ryan Burdick, who took 1st place overall in Open Bass Drum competition, and Billy Lang, who took 1st place overall in Intermediate Bass Drum competition. April Leslie and Sheena Saayman took 1st and 2nd place overall, respectively, in Grade 3 Tenor Drum contests. Susie Shoemaker took 2nd in her first season of Grade 4 Tenor Drum competition. Susie also played masterfully on the snare drum this year, earning 1st place in the Grade 2 Side Drumming competition. Our pipers did quite well in solo competition this season as well. Aaron Cornils and Elaine Shoemaker took 2nd and 3rd place, respectively, in Grade 4 Piping. The Grade 4 pool is the largest by far for the solo pipers, with 123 individuals competing in 2015, making their accomplishments that much more noteworthy! Others who did quite well in Grade 4 were Jim Fogelman who took 9th place, Nathaniel Bazer in 17th place, and David Debroux in 21st place. In Grade 3 Piping, Stephanie Trudeau took 4th place overall, Elizabeth McCarty took 6th, and Laura Scott took 11th. There were 50 competitors in the Grade 3 pool. In Grade 2 Henry McCarthy placed 8th out of 21 pipers. In Grade 1, Austin Diepenhorst won 2nd out of 14 competitors, and Abraham McCarty came in at 4th. This year the piping scores for piobaireachd competition were separated from those for the light music. Austin Diepenhorst took 1st in the Grade 1 division and Abraham McCarty came in a close 2nd. Laura Scott took 5th place out of the 42 competitors in Grade 3. If you’d like to see the breakdown for all the aggregate solo results this year, check them out here on WUSPBA’s website. Great job to all the competitors this season! Thank you to all the supporters of our band and of the individuals in it–you have undoubtedly played a part in all of these accomplishments! And thank you to all our band members too, who have worked very hard to attain their success. We hope to continue pushing forward next year as we work our way towards competing at the World’s in August 2016! Keep up the good work!